I am always inspired by Margaret Bremner's sensational style of art. 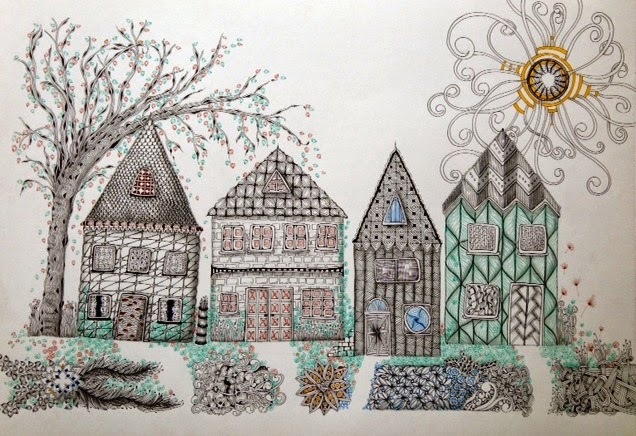 Her blog Enthusiastic Artist is full of exquisite tangling. I love her quirky houses and have wanted to try and tangle a street scene for quite a while. When I started the 1st house it looked a bit like a child's drawing and I nearly tossed it but I kept thinking of what I say to anyone who feels critical in my Zentangle classes....don't be hard on yourself, keep going, have fun, it will turn out to be a lovely surprise! Then I relaxed and became quite amused with the roofs, the little paths leading through the gardens up to the front doors and the arukas sun. I also enjoyed tangling the diva dance tree with the falling autumn leaves, now it's finished I am happy to share my quirky little street scene. Hope it makes you smile too!! This really is so beautiful. Love it very much. Wow, this is really awesome!! Personally I like it a bit more than Margaret's. Simply because it's easier to figure out. I love what you've done with the tree -the leaves are beautiful and also the sun!!!!! It almost looks like a steampunk sun! 😀. Congratulations for a wonderful creation!!! Cette rue nous conduit dans un beau pays féerique !!! I also am very impressed by Margareths houses, and have tried it several times, but without succes. I know how difficult it is. You did a great job, Love the houses and gardens, your Diva Dance tree is gorgeous! Great houses! Love your art. Thanks for reminding us that yes, just keep going and see what happens... love these little houses!